A winner since it was launched, the Odyssey 2 Ball Putter has literally become a putting phenomenon. Odyssey itself has brought out many different designs using the 2 ball aiming system, and dozens of copy cat designs (not to mention counterfeit putters) can also be found. But is the Odyssey 2 Ball really as good as the hype suggests? If it weren't for the two ball design on the top of this putter, we still think it would be a fairly handsome beast. Yes, it is big and doesn't have a sleek line anywhere about its person, but as you'd expect from Odyssey, who usually go for science rather than style in their designs the finish is excellent and the design has no rough edges. 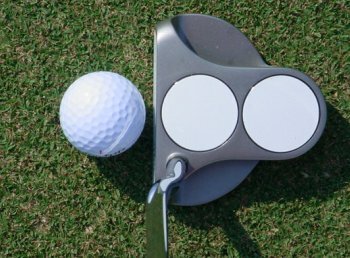 It's the two ball design on the top of the back portion of the putter, however, which dominates your vision as you stand over the ball. This, of course, was the designer's intention. Seeing two white disks which are exactly the same size as the ball you're about to hit make this just about the easiest putter you can find to aim up well. The design is an absolute winner. The Odyssey 2 Ball Putter is by no means subtle! With such a big head on it, the putter itself is pretty heavy and when you strike the ball you get the feeling that your hitting it with a clumpy wooden mallet rather than a high tech, finely weighted putter. The designers of the two ball, however, knew what they were doing... They realised that a big head with a lot of weight set back from the putter face gives you enormous resistance to twisting. The sensation of hitting the ball with a mallet makes you realise just how much your normal putter twists on an off centre hit. The White hot insert which the classic Odyssey 2 Ball had is one of their best too, and gives you a soft yet purposeful feel. Like all Odyssey putters, the roll is awesome. You don't find putters which roll it much better. An absolutely legendary design and roll. Looks are futuristic, but pleasing and the 2ball aiming design on the top is extremely easy and very natural to line up. All in all it's probably the best face balanced putter that's been made in the last 15 years.